This stunning stud earring and pendant set by Michael Kors combines sparkle and timeless elegance. With solitaire round cubic zirconias set within a rose gold plated four-hand claw, the earrings offer an effortless shimmer. 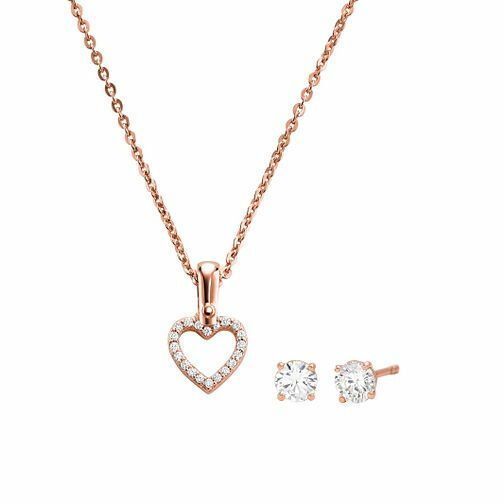 A rose gold plated chain presents the endearing pendant, with an open heart design adorned with cubic zirconias, set to capture the light and hearts! The clasp features an additional drop chain, with a MK key charm. A beautiful set for treating yourself or a loved one to. Michael Kors 14ct Rose Gold Plated Heart Earrings & Pendant is rated 5.0 out of 5 by 2. Rated 5 out of 5 by Anonymous from This product is great! Great product, with great service. When I got the product I loved it, and my girlfriend loved it too!